Today’s Carpe Scream, I decided to have some fun. I looked up the 1958 psychological horror B-movie, The Screaming Skull. This one is just a corny cheese-fest. 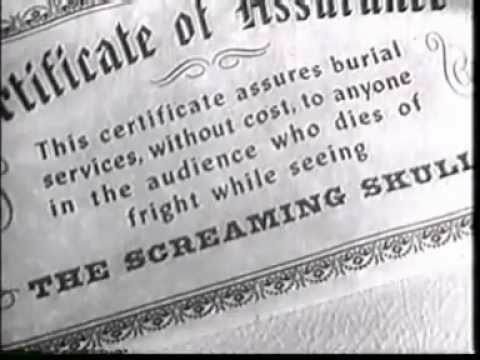 It starts off with the producers of the film making the grandiose claim that the finale of the movie is so terrifying that they promised a free coffin to anyone who dies of fright while viewing it. The premise and plot is actually pretty good, and the ending was a fairly good surprise and very entertaining.. The only problem is that there’s only about 20 minutes of story in this movie. Poor editing, bad pacing, and a lot of awkward silences where nothing is happening drag this out to a yawn-inducing 68 minutes. As Mystery Science Theater pointed out, “they took a tiny movie and put it in a huge box full of packing peanuts.” That being said, there’s a lot of great moments in this movie, and one can’t help seeing the brilliance under the truckload of packing peanuts.